Habilitation à Diriger des Recherches, October 1996, Université Paris VII Denis Diderot. Report: Sur l'implantation haute-performance des langages logiques (On the high-performance implementation of logic languages) (in French and English). Ph.D. in Computer Science, UC Berkeley, December 1990. Dissertation: Can Logic Programming Execute as Fast as Imperative Programming? M.S. in Computer Science, UC Berkeley, August 1984. Report: A Prolog Compiler for the PLM. Mechanical/Electrotechnical Engineer with specialization Computer Science, Vrije Universiteit Brussel, Belgium, July 1983. Report: Design and Implementation of an Interactive Extensible Compiler (in Dutch). Peter Van Roy, Designing, Drawing, and Colorizing Generated Images by Computer, U.S. Patent 5,831,633, issued Nov. 3, 1998. Peter Van Roy and Seif Haridi, Programmation: Concepts, techniques et modèles (in French), translated and adapted from the English version by Peter Van Roy, Dunod Éditeur, 368 pages, Sept. 2007. With software complement Programmation: Labo interactif. Peter Van Roy (Ed. ), Multiparadigm Programming in Mozart/Oz, Second International Conference (MOZ 2004), Charleroi, Belgium, Oct. 7-8, 2004, Revised Selected and Invited Papers. Springer-Verlag Lecture Notes in Computer Science, volume 3389, 342 pages, March 2005. Table of contents, Springer Web Site. Peter Van Roy and Seif Haridi, Concepts, Techniques, and Models of Computer Programming, MIT Press, 929 pages, March 2004. Programmation: Labo interactif (Interactive programming laboratory) (in French, version 1.0, Sept. 2007), by Yves Jaradin and Peter Van Roy, commercial software, ScienceActive. Software complement to the book Programmation: Concepts, techniques et modèles. The Mozart Programming System (version 1.3.0, 2004). A development platform for Unix/Windows/MacOSX applications with advanced support for open, robust, transparent distributed programming and symbolic calculation including constraint-based inferencing. Distributed under Open Source software license. FractaSketch (version 2.03, patented, 2000). A drawing tool for Macintosh that allows fast interactive design of beautiful images of great complexity and subtle colorization. Distributed as freeware (formerly a commercial product of Dynamic Software). Logical State Threads (version 0.1, 1997). A package for SICStus Prolog that simplifies the development of large, purely declarative Prolog programs. Distributed as source code. Wild_LIFE (version 1.01, 1994). Complete implementation of LIFE, a successor to Prolog. Distributed with full source code. No longer maintained. Aquarius Prolog (version 1.0, 1993). A high-performance Prolog system for Unix that rivals C performance. Distributed with full source code. No longer maintained. Peter Van Roy. Scale and Design for Peer-to-Peer and Cloud, Conference on Matters of Scale, TTI Vanguard, July 20-21, 2010, London, UK. Peter Van Roy, The Principal Programming Paradigms (Les Principaux Paradigmes de Programmation) (in French), invited talk at the Université Pierre et Marie Curie, Paris, France (Jan. 11, 2008). Earlier version given at IRCAM colloquium on new computational paradigms for computer music, Paris, France (June 11, 2007). (English poster in JPEG). Peter Van Roy, Reflections on Self Management in Software Development, invited talk, Scottish Programming Language Seminar, Edinburgh, UK, Sept. 28, 2007. Also invited lecture, Almende Summer School, Rotterdam, the Netherlands, Aug. 29, 2007. Peter Van Roy, Self Management and the Future of Software Design, invited talk at FACS '06, Prague, Czech Republic, Sep. 20, 2006. Peter Van Roy, How to Say a Lot with Few Words, invited talk on functional, concurrent, and multiagent programming at IRCAM, Paris, France, May 12, 2006 (demo code). Peter Van Roy, Convergence in Language Design: A Case of Lightning Striking Four Times in the Same Place, invited talk at Eighth International Symposium on Functional and Logic Programming (FLOPS 2006), Fuji Susono, Japan, April 25, 2006 (article, demo code). Peter Van Roy, The Road to Distributed Programming: From Network Transparency to Structured Overlay Networks and Onward to Self Management, invited talk at Universiteit Antwerpen, Antwerp, Belgium, March 2, 2006. Peter Van Roy American University Tour, visits and talks at five American universities (Nov. 7-11, 2005). Peter Van Roy, A Concepts-Based Approach for Teaching Programming, invited talk at CIESC 2005 / CLEI 2005, Cali, Colombia, Oct. 10-14, 2005. Similar talks were given at SIGCSE 2004 and SIGCSE 2005 Birds of a Feather Sessions (March 2004 and Feb. 2005) and to the British Computer Society's Advanced Programming Specialist Group (Dec. 9, 2004). Peter Van Roy, Aspect-Oriented Programming for Distributed Systems: Its Use, Its Effect on Language Design, and Its Limits, presented at Belgian Symposium and Contact Day on Software Evolution and Aspect-Oriented Programming, Ghent, Belgium, May 3, 2004 (abstract). Peter Van Roy, The Importance of Concepts when Teaching Programming, position statement for "The Role of Language Paradigms in Teaching Programming", panel discussion, SIGCSE 2003, March 2003 (accompanying article). Peter Van Roy and Seif Haridi, Teaching Programming Broadly and Deeply: The Kernel Language Approach, recent version of a talk given at various places (UCL, KUL, VUB, FDPE02, ICTEM 2002, WFLP 2001, ...), July 2002. Peter Van Roy, Robust distributed programming in the Mozart platform: the importance of language design and distributed algorithms, invited talk, Langages et Modeles a Objets (LMO'2002), Montpellier, France, January 2002. Peter Van Roy, The Mozart Programming System and Its Use for Agent Applications, presented at AXLOG Seminar on Planning and Scheduling with Constraints for Autonomic Agents, Paris, France, February 2000. Peter Van Roy, A new mobile state protocol for Distributed Oz, presented at PDCS 99, Ft. Lauderdale, Florida, August 1999. Idea by Per Brand and Peter Van Roy, correctness proof and slides by Peter Van Roy, paper written up by Mustapha Hadim. Peter Van Roy and Seif Haridi, Distributed Unification and Efficient Logic Variables for Distributed Computing. Talks to accompany the article Efficient Logic Variables for Distributed Computing, ACM TOPLAS, May 1999. Peter Van Roy, Seif Haridi, and Alexander Reinefeld, Designing Robust and Adaptive Distributed Systems with Weakly Interacting Feedback Structures, Research Report RR2011-01, ICTEAM Institute, Informatics Hub, Université catholique de Louvain, Jan. 2011. Peter Van Roy, The CTM Approach for Teaching and Learning Programming, Chapter 5, Horizons in Computer Science Research, Volume 2, Nova Science Publishers, 2010. Peter Van Roy, Programming Paradigms for Dummies: What Every Programmer Should Know, New Computational Paradigms for Computer Music, G. Assayag and A. Gerzso (eds. ), IRCAM/Delatour France, June 2009. Boris Mejías and Peter Van Roy, The Relaxed Ring: A Fault-Tolerant Topology for Structured Overlay Networks, Journal of Parallel Processing Letters, 18(3), Sep. 2008. Peter Van Roy, Self Management and the Future of Software Design, invited talk, Third International Workshop on Formal Aspects of Component Software (FACS '06), Springer ENTCS 182, Sept. 2006 (talk slides). Peter Van Roy, Convergence in Language Design: A Case of Lightning Striking Four Times in the Same Place, invited talk, Eighth International Symposium on Functional and Logic Programming (FLOPS 2006), Fuji Susono, Japan, Springer-Verlag LNCS volume 3945, April 2006. (talk slides, demonstration code). Fred Spiessens and Peter Van Roy, The Oz-E Project: Design Guidelines for a Secure Multiparadigm Programming Language, Springer-Verlag Lecture Notes in Artificial Intelligence, volume 3389, 2005 (to appear). Donatien Grolaux, Peter Van Roy, and Jean Vanderdonckt, Migratable User Interfaces: Beyond Migratory Interfaces, First Annual International Conference on Mobile and Ubiquitous Systems (MobiQuitous 2004), Boston, Massachusetts, August 2004. 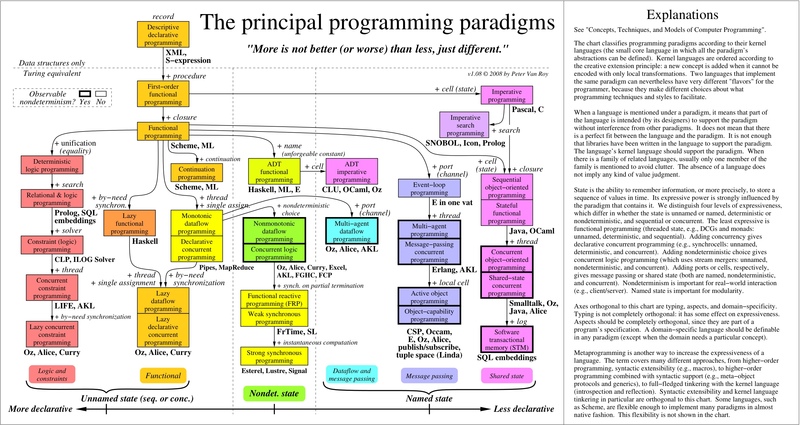 Peter Van Roy, Per Brand, Denys Duchier, Seif Haridi, Martin Henz, and Christian Schulte, Logic programming in the context of multiparadigm programming: the Oz experience, Journal of Theory and Practice of Logic Programming (TPLP), November 2003, pages 715-763 (PostScript, PDF). Fred Spiessens, Raphaël Collet, and Peter Van Roy, Declarative Laziness in a Concurrent Constraint Language, 2nd International Workshop on Multiparadigm Constraint Programming Languages (MultiCPL 2003), at the 9th International Conference on Principles and Practice of Constraint Programming (CP2003), Kinsale, Ireland, September 2003. Luis Quesada, Stefano Gualandi, and Peter Van Roy, Implementing a Distributed Shortest Path Propagator with Message Passing, 2nd International Workshop on Multiparadigm Constraint Programming Languages (MultiCPL 2003), at the 9th International Conference on Principles and Practice of Constraint Programming (CP2003), Kinsale, Ireland, September 2003 (PostScript, PDF). Valentin A. Mesaros, Bruno Carton, and Peter Van Roy, S-Chord: Using Symmetry to Improve Lookup Efficiency in Chord, International Conference on Parallel and Distributed Processing Techniques and Applications (PDPTA'03), June 2003 (PowerPoint slides). Peter Van Roy, Joe Armstrong, Matthew Flatt, and Boris Magnusson, The Role of Language Paradigms in Teaching Programming, 34th Technical Symposium on Computer Science Education (SIGCSE 2003), February 2003. Peter Van Roy and Seif Haridi, Teaching Programming with the Kernel Language Approach, Workshop on Functional and Declarative Programming in Education (FDPE02), at Principles, Logics, and Implementations of High-Level Programming Languages (PLI2002), Pittsburgh, PA, October 2002. Luc Onana Alima, Valentin Mesaros, Peter Van Roy, and Seif Haridi, NetProber: A Component for Enhancing Efficiency of Overlay Networks in P2P Systems, 2nd IEEE International Conference on Peer-to-Peer Computing (P2P2002), Linkoping, Sweden, September 2002. Donatien Grolaux, Peter Van Roy, and Jean Vanderdonckt, FlexClock: A Plastic Clock Written in Oz with the QTk Toolkit, Proceedings of 1st International Workshop on Task Models and Diagrams for User Interface Design (TAMODIA 2002), Bucharest, Romania, July 2002. Peter Van Roy and Seif Haridi, Teaching Programming Broadly and Deeply: The Kernel Language Approach, IFIP Working Group 3.2 Working Conference ``Informatics Curricula, Teaching Methods, and Best Practice'' (ICTEM 2002), Florianopolis, Brazil, July 2002. Donatien Grolaux, Peter Van Roy, and Jean Vanderdonckt, QTk -- A Mixed Declarative/Procedural Approach for Designing Executable User Interfaces, short paper, 8th IFIP Working Conference on Engineering for Human-Computer Interaction (EHCI'01), Toronto, Canada, May 2001. Iliès Alouini and Peter Van Roy, Fault-tolerant Mobile Agents in Mozart, poster, 2nd International Symposium on Agent Systems and Applications (ASA 2000) and 4th International Symposium on Mobile Agents (MA 2000), Zurich, Switzerland, September 2000. Peter Van Roy, Logic programming in Oz with Mozart (1700K), invited tutorial, International Conference on Logic Programming (ICLP 99), Las Cruces, New Mexico, November-December 1999. Peter Van Roy, Per Brand, Seif Haridi, and Raphaël Collet, A Lightweight Reliable Object Migration Protocol (300K), in Lecture Notes on Computer Science, Vol. 1686, October 1999. Mustapha Hadim and Peter Van Roy, A new mobile state protocol for Distributed Oz (360K) (slides of talk), ISCA 12th International Conference on Parallel and Distributed Programming (PDCS 99), Ft. Lauderdale, Florida, August 1999. Peter Van Roy, On the separation of concerns in distributed programming: Application to distribution structure and fault tolerance in Mozart (180K), International Workshop on Parallel and Distributed Computing for Symbolic and Irregular Applications (PDSIA 99), Sendai, Japan, July 1999. Seif Haridi, Peter Van Roy, Per Brand, Michael Mehl, Ralf Scheidhauer, and Gert Smolka, Efficient Logic Variables for Distributed Computing (600K), ACM Transactions on Programming Languages and Systems (TOPLAS), May 1999. Iliès Alouini and Peter Van Roy, Le protocole réparti de Distributed Oz (190K) (in French), Colloque Francophone sur l'Ingénierie des Protocoles, Nancy, France, April 1999. Seif Haridi, Peter Van Roy, Per Brand, and Christian Schulte, Programming Languages for Distributed Applications (370K), New Generation Computing, May 1998, Vol. 16, No. 3, pp. 223-261. Peter Van Roy, Seif Haridi, Per Brand, Gert Smolka, Michael Mehl, and Ralf Scheidhauer, Mobile Objects in Distributed Oz (900K), ACM Transactions on Programming Languages and Systems (TOPLAS), September 1997, pp. 804-851. Seif Haridi, Peter Van Roy, and Gert Smolka, An Overview of the Design of Distributed Oz (230K), International Symposium on Parallel Symbolic Computation (PASCO '97), World Scientific, July 1997. Peter Van Roy, Michael Mehl, and Ralf Scheidhauer, Integrating Efficient Records into Concurrent Constraint Programming (170K), 8th International Symposium on Programming Languages, Implementations, Logics, and Programs (PLILP 96), Aachen, Germany, Sept. 1996, pp. 438-453. Bruce K. Holmer, Barton Sano, Michael Carlton, Peter Van Roy, Alvin M. Despain, Design and Analysis of Hardware for High Performance Prolog (1500K), Journal of Logic Programming, 1996, pp. 107-139. Martin Müller, Tobias Müller, and Peter Van Roy, Multiparadigm Programming in Oz (280K), Workshop on the Future of Logic Programming, International Logic Programming Symposium (ILPS), Oregon, USA, Dec. 1995. Bernt Wahl, with contributions by Peter Van Roy, Michael Larsen, and Eric Kampman, Exploring Fractals on the Macintosh, Addison-Wesley, 1994. Book with software. Peter Van Roy, 1983-1993: The Wonder Years of Sequential Prolog Implementation (450K), Journal of Logic Programming, Elsevier, Vol. 19/20, May/July 1994, pp. 385-441. Also available as Research Report 36, Digital Equipment Corporation, Paris Research Laboratory, 1994. Hassan Aït-Kaci, Bruno Dumant, Richard Meyer, Andreas Podelski, Peter Van Roy, The Wild LIFE Handbook (700K), Digital Equipment Corporation, Paris Research Laboratory, 1994. Andreas Podelski and Peter Van Roy, The Beauty and the Beast Algorithm: Quasi-Linear Incremental Tests of Entailment and Disentailment over Trees (150K), International Logic Programming Symposium (ILPS), MIT Press, Nov. 1994, pp. 359-374. See also ILPS, MIT Press, Oct. 1993, page 653. Peter Van Roy and Alvin Despain, High-Performance Logic Programming with the Aquarius Prolog Compiler, IEEE Computer, Jan. 1992, pp. 54-68. Bruce Holmer, Barton Sano, Mike Carlton, Peter Van Roy, Ralph Haygood, William Bush, Alvin Despain, Joan Pendleton, Tep Dobry, Fast Prolog with an Extended General Purpose Architecture (230K), 17th International Symposium on Computer Architecture (ISCA), May 1990, pp. 282-291. Peter Van Roy, A Useful Extension to Prolog's Definite Clause Grammar Notation (30K), ACM SIGPLAN Notices, Vol. 24, No. 11, Nov. 1989, pp. 132-134. Prolog source code of preprocessor. User manual for preprocessor (40K). Mike Carlton and Peter Van Roy, A Distributed Prolog System with And Parallelism, IEEE Software, Jan. 1988, pp. 43-51. Peter Van Roy, A Prolog Compiler for the PLM, Technical Report UCB/CSD 84/203, Computer Science Division, UC Berkeley, August 1984.